Last updated July 2017 for clarity and protocol updates. Welcome to the first part of our drone racer build guide! In this series of articles, we are going back to the basics and giving detailed instructions on how to build your first racing drone. This series is structured for beginners, so those of you who have been in the hobby for awhile might want to jump around within the series where applicable. If you prefer video guides, you can watch part 1 of our build video here. The entire build a drone playlist is complete on YouTube, and can be watched by clicking here. What is a Racing Drone? These aircraft can be flown everywhere – inside your yard, in a forest, in an urban setting, or out in an open field. They offer you the ability to safely experience flight in a way that has never been possible to humans before. I have been piloting remote controlled aircraft for more than a decade, and drone racers are by far the most fun I have ever had. If you have fun flying the toy quadcopters you can buy at most electronics stores – I can guarantee that you will have a blast flying a drone racer. If you want to learn more about these remarkable aircraft, check out our Racing Drone FAQ or our extensive Drone Racing Guide, which details everything you need to know to get into the hobby. Before spending any of your hard earned money, we highly recommend doing your research before ordering a ton of parts. Recently, many affordable ready-to-fly quadcopters have been released that are increasingly impressive in their performance. To learn some of the differences between building via parts, buying a ready to fly quad, and building from a kit, we recommend reading this article. These are the parts we will be using in this guide. When picking up parts for your quadcopter, there are a ton of options. Over the past few months, we’ve written several buyers guides that cover nearly every component that goes into building a racing drone. This would be a great place to start so that you can become more familiar with each of the parts that make up the final quadcopter. These guides are broken into two sections. The first part overviews the component and reviews what you should look for when shopping for that specific part. The second section looks at our personal purchase recommendations. We are sticklers for keeping these guides up to date, so check back often! Buy a frame with a good build log you can find online. You can find build logs by simply searching “<your frame> build log” on Google. This will give you something to follow when doing your build. Buy 2205 motors known to fit your frame. You don’t want to have to modify your arms on your first build. Learn more about motor sizes in our motor guide. Buy reliable ESCs that run BLHeli. 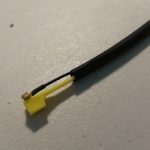 Good ESCs are the most important part of a racing drone – don’t skimp! You don’t have to break the bank in order to have a fantastic drone racer. You can build a quad that performs identically to the those that the pros fly for under $200 (without the video system). which is exactly what we will be creating through this series of articles. 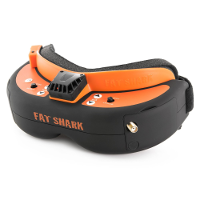 In the final article in this series, we will add in a video system to allow for FPV supported flight. 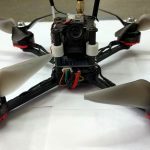 Why start the build without FPV? We explain this in our guide on how to get into the hobby. You can buy all the non-FPV components pictured above at Banggood with money to spare for your RC receiver while staying under $200. Banggood is a retailer shipping out of China that has a lot of similarities with Amazon here in the states. They carry a huge stock of all types of items for extremely low prices. In particular, they are known for stocking quality drone equipment. Unlike most Chinese retailers, you generally won’t spend more than $5 for “priority shipping”. In the United States, you will generally receive your items within a week if you pick priority shipping. They also have very good customer service which we have dealt with in several circumstances. Finally, by buying Banggood items from our links, you will be supporting our site – this is how we pay the bills, and it doesn’t cost you a dime! For these reasons, we recommend purchasing your first kit from Banggood if you are on a budget. We also list other great vendors in the hobby on our vendor page if you want to shop around. If you want to follow along directly with our guide, we recommend you use the parts found in the build list below. Please note that we may update this from time to time to make sure you are getting the latest and greatest technology. These changes will always be confined to updates to the ESCs and motors, though, and will not effect the build instructions to follow. As a final note – we are going to endeavor to keep the instructions founds in this article as general as possible. If you follow the guidelines above, you should be able to follow along with our guide no matter what parts you buy. You may notice that the frame listed is very similar to other kit builds in the hobby at the moment – namely the “Dubai 210” kit. This guide would also serve as a suitable Dubai 210 build log. Here are all the required tools for this build. Using the proper tools is just as important as using the correct parts. 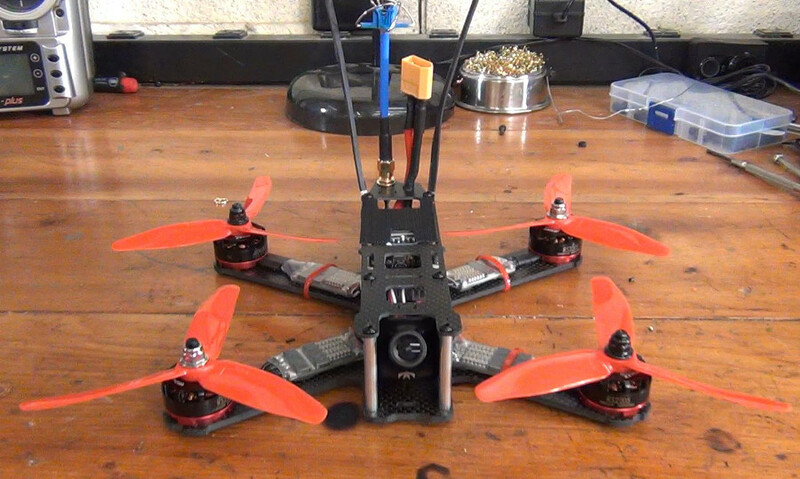 We have an entire article on tools needed to build a quadcopter, or you can reference the picture above. For most beginners, this may be the first time buying and using a soldering iron. If it is your first time, you should take some time to get familiar with it and do some practice sessions with some disposable equipment so that you do not ruin your shiny new racing drone. 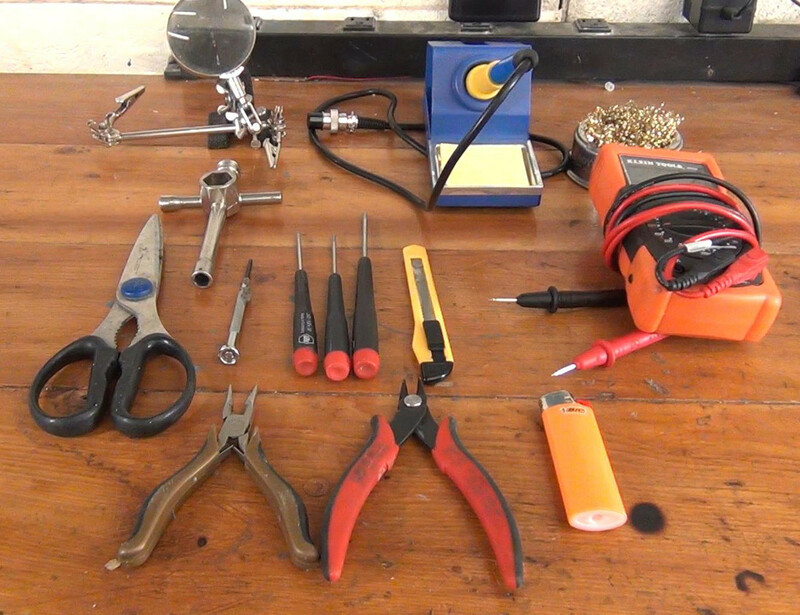 We have an article on getting started with soldering that offers some exercises that you may find useful. Here are the “extra” parts we used to finish our build. 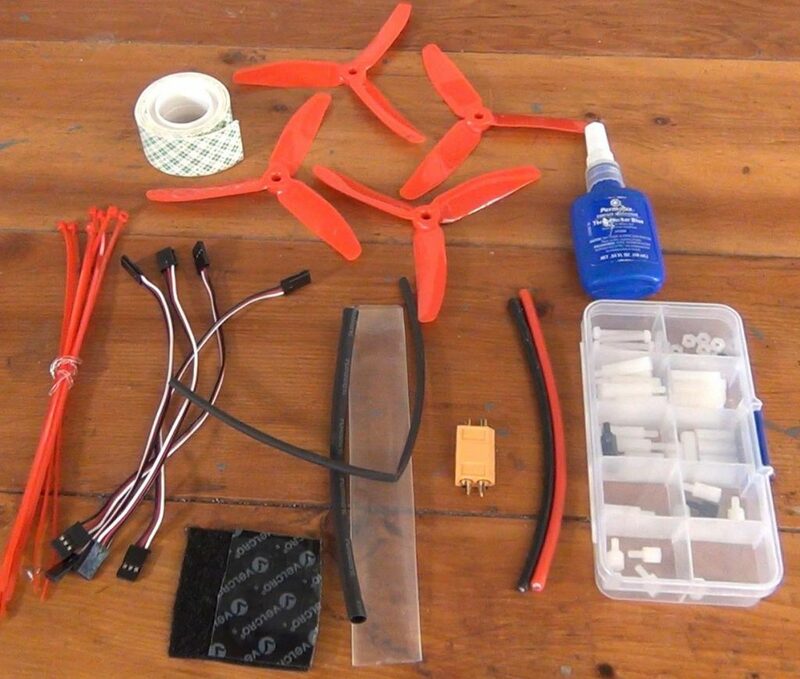 There are a few “consumable” items you will need to properly finish any quadcopter build. These are the odds and ends that clean up your build and connect all the individual pieces together. Similarly, these are components that you will inevitably use for quadcopter repairs and modifications down the road. If you want to read more about build consumables with more detailed descriptions of each, check out our article here! Many of these items can be purchased from your local hardware store. The ones that cannot, like the props and connectors, can be purchased at any big online retailer like Banggood, Amazon, or eBay. To save yourself some frustration while building, we recommend you get all the above parts, tools, and consumables together on your workbench before you begin doing anything. Once you’re ready, continue on to the next article where we will assemble the frame! Build a racing drone series complete! How to build a racing drone | Frame assembly video!